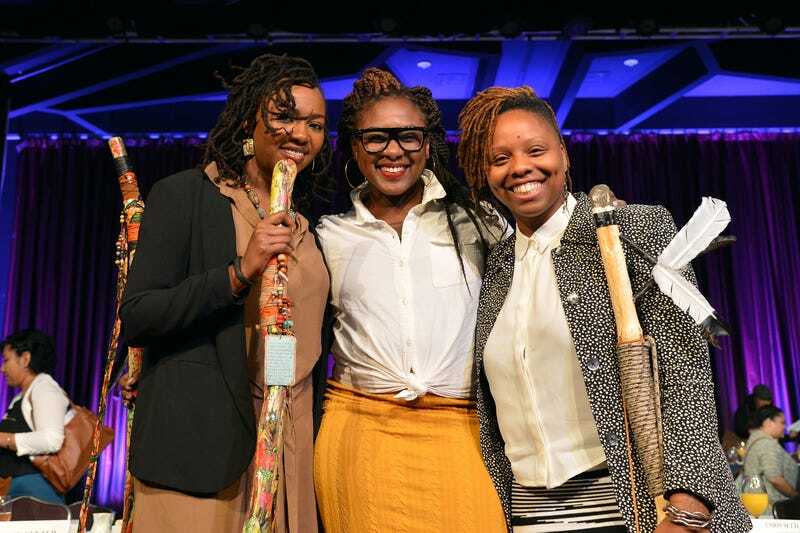 #BlackLivesMatter co-founders Opal Tometi, Alicia Garza and Patrisse Cullors appear onstage during a breakfast honoring them by the New York Women’s Foundation on May 14, 2015, in New York City. In a statement released exclusively to Mic, BLM said that it will continue to organize and work to end all state-sanctioned violence until all black lives matter. The organization said that the work will be harder, but the work is still the same. Our mandate has not changed: organize and end all state-sanctioned violence until all Black Lives Matter. What is true today—and has been true since the seizure of this land—is that when black people and women build power, white people become resentful. Last week, that resentment manifested itself in the election of a white supremacist to the highest office in American government. In the three years since Black Lives Matter organized, we've called for more safety. Not less. We've demanded an end to anti-black state violence. We've asked white people to organize their communities, to courageously help their loved ones understand the importance of solidarity and to show up for us, for themselves and democracy. In the months leading up to this election, we have demanded support from white people in dismantling white supremacy—a farce that persuaded some to believe we were living in a post-racial America while simultaneously rolling back the rights of black people and other people of color. White supremacy fortified the decision to disregard racism and sexism as serious variables in the outcome of this election. Even if everyone didn't agree politically, at the very least, we deserved to have our collective humanity affirmed. We feel more than disappointed or angry—we feel betrayed. Donald Trump has promised more death, disenfranchisement and deportations. We believe him. The violence he will inflict in office, and the permission he gives for others to commit violence, is just beginning to emerge. In the face of this, our commitment remains the same: protect ourselves and our communities. But we ask ourselves—how do we reconcile our vision for future generations' prosperity with the knowledge that more than half of white voting Americans believe a white supremacist can and should decide what's best for this country? Here's what we know: Civic engagement is one way to engage democracy, and our lives don't revolve around election cycles. We are obliged to earn the trust of future generations—to defend economic, social and political power for all people. We are confident that we have the commitment, the people power and the vision to organize our country into a safe place for black people—one that leads with inclusivity and a commitment to justice, not intimidation and fear. We also need and deserve an elaborate strategy to eradicate both white supremacy and implicit bias towards it. We must reckon with the anti-blackness of America's history that led to this political moment. We continue to operate from a place of love for our people and a deep yearning for real freedom. In our work, we center the most marginalized, and look to them for leadership. We fight for our collective liberation because we are clear that until black people are free, no one is free. We are committed to practicing empathy for one another in this struggle—but we do not and will not negotiate with racists, fascists or anyone who demands we compromise our existence. We affirm our existence. We affirm our right to not only live, but to thrive. To exist in a world where our humanity is seen and honored. We are organizing to realize a world in which our faiths are held in esteem, our identities are respected and our families are prioritized. We deserve a world in which our children are protected, where our water is sacred, and where we are given a fair chance to decide our fates. Because it is our duty to win, we will continue to fight. And today, like every day before it, we demand reparations, economic justice, a commitment to black futures and an end to the war on black people, in the United States and around the world. The work will be harder, but the work is the same.